This is not Engine 6 crew it is Engine 12 taken out in front of old Station 12. The date this picture was taken in unknown, probably sometime in the early sixties. 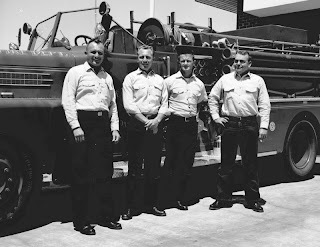 The Rig is a 1957 Pirsch 1000 gpm pumper. Captain Larry Norton (Best man at Bob's wedding), Bill Yowell, Unknown, and Engineer Gene Adams.